A new integrated school must attract 30% of its pupils from the minority community in the area where the school is situated. Existing schools, transforming to integrated status, must demonstrate the ability to achieve a minimum of 10% of their 1st year intake drawn from the minority tradition (Protestant or Roman Catholic) within the school’s enrolment and the potential to achieve a minimum of 30% in the longer term. 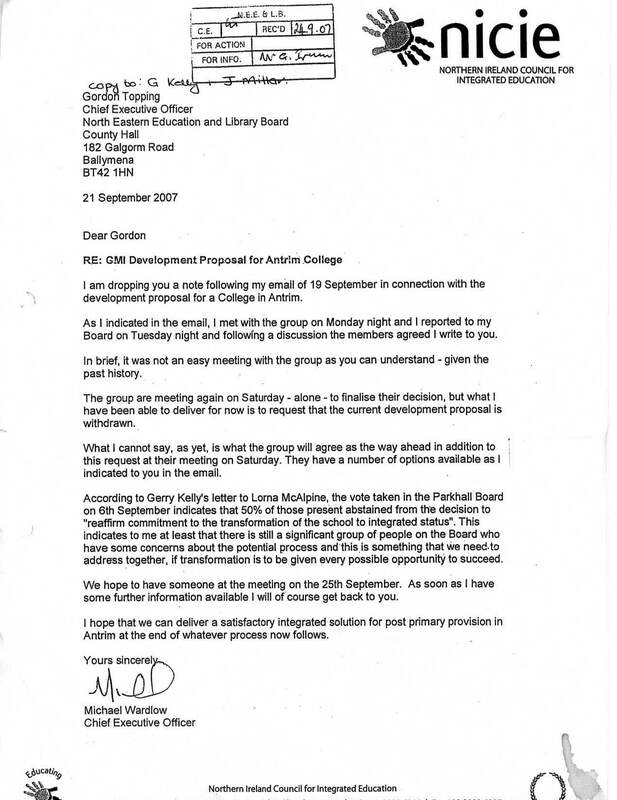 If Antrim’s local unionist representatives, including the Democratic Unionist Party’s Rev William McCrea MP, MLA had any concern for the controlled sector they would have expressed outrage over the expense, method and misinformation surrounding the “transformation” of the last remaining secondary school in Antrim. The Ulster Unionist Party are even more culpable since two councillors, including Antrim’s Lord Mayor, Adrian Watson, sat on the Board of Governors of Parkhall College during the period. The North Eastern Education & Library Board and Northern Ireland Council for Integrated Education senior officials were responsible for the development proposal submitted to the DENI. They must be held to account for their misinformation campaign that resulted in a school gaining transformation status on the basis of 2.2% of pupils coming from the minority community. 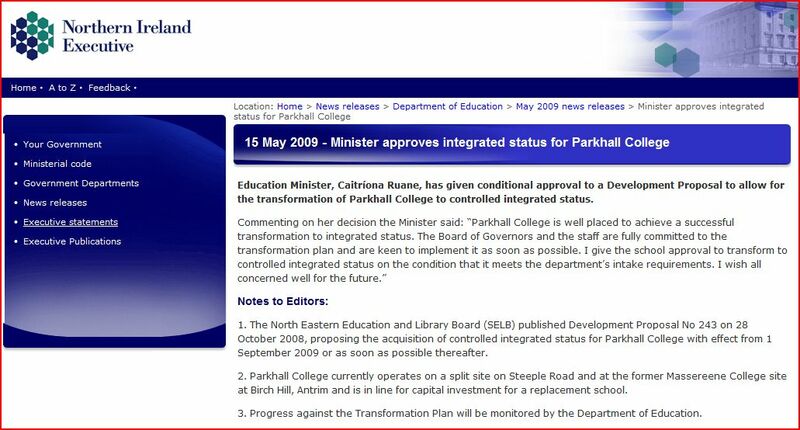 The North Eastern Education and Library Board have claimed that transformation to controlled integrated status of Parkhall College is a process not a single act. PACE are publishing various documents obtained under the Freedom of Information Act 2000 to help with the public interest aspects of removal of education options in Antrim. Catholic parents considering Parkhall College as an option must bear in mind the possibility that parents may exercise their right to seek another vote on the status of the school and revert back to controlled status. The final paragraph of The Northern Ireland Council for Integrated Education chief executive Michael Wardlow’s letter to NEELB chief executive Gordon Topping indicates the predetermination focus for an integrated solution regardless of parental views otherwise.